March is international Dolphin Awareness Month and South Africa’s Springbok Casino -- time to learn more about these special marine mammals and get bonuses for a popular undersea slot game. Springbok is paying tribute to dolphins by helping people understand how intelligent, social, compassionate and vulnerable they are. Until the end of the month they’re also giving free spins on the Crystal Waters slot from Realtime Gaming. Ever since a recent holiday experience, Springbok casino manager Daniel van Wyk has been devoted to dolphins. 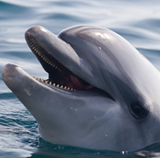 Van Wyk has put together a Dolphin Awareness web page with videos exploring many aspects of the lives of our dolphin cousins: Why do dolphins jump and show off? Will they really stop to help an injured dolphin -- even a human -- in need? Do dolphins sleep?! How do they communicate? 25 free spins on Crystal Waters slot available until March 31st. One video on the page shows a pod of dolphins holding an injured member of their family above water so she could breathe. Another shows a dolphin tangled in fishing line asking a diver for help. There’s even a heart warming video showing a baby dolphin seeing the light of day for the very first time. Until March 31st, South African casino players can get 25 free spins on the Crystal Waters slot using coupon code "DOLPHINES". Crystal Waters is an undersea adventure featuring dolphins and other marine animals like turtles and sea horses. It's known to be generous with free spins. The Scatter symbol is a Yacht and three or more of them anywhere on the reels trigger 15 free spins. During the free games a wild Bonus Fish may appear and multiply wins up to 8x. Springbok Casino has hundreds more slots and table games from Realtime Gaming, all played in Rands. The South African online casino and mobile casino provides customer service in both English and Afrikaans.